With more and more health concerns regarding chemical ingredients in skin care and grooming products, many people have begun choosing products containing natural and organic ingredients. Men as well women want to protect their health and are active in seeking out natural grooming products. This makes finding the best natural and organic shaving cream a must for many men. Do keep in mind, though, that organic shaving creams might not in some cases going to lather like those chemical filled shaving creams since chemicals such as Sodium Lauryl Sulfates is what actually makes the lather in many shaving creams, soaps and even toothpastes. 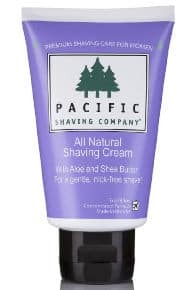 The Pacific Shaving Company Natural Shaving Cream with a light citrus scent is an all natural shaving cream that comes in a 3 ounce container which is perfect for traveling as well as for home use. However, just because this shaving product in a tube is small in size, it doesn’t mean that it will be used up quickly as this small tube provides about 40 shaves when used as directed. This shaving cream does not lather like most chemical laden shaving creams and soaps which is a sign that ingredients are natural. Nevertheless, users report that this does not prevent them from getting a great shave. It contains a lot of healthy and natural ingredients including Aloe leaf extract, sunflower seed oil and Clover extract as well as vitamin A, C and E.
Users really like the Pacific Shaving Cream and find the hint of citrus scent to be pleasant and masculine. This product lasts longer when applied with a brush rather than your hand. It results in a close smooth shave, leaving your face feeling fresh and moisturized. In addition, you won´t feel any irritation when using it. The Herban Cowboy “Dusk” Premium shave cream comes in a 6.7 ounce squeeze tube and is alcohol free. According to the company, it conditions and soothes the skin as you shave. It is a non-lathering shave cream and contains ingredients such as aloe, lavender and cooling menthol. Users give it high ratings and state that it is extremely creamy and goes on evenly and smooth. You will also find that it really raises the facial hair resulting in an incredibly close shave. People say that they experience less razor burn and irritation, and it leaves the face cool and tingling without leaving it oily or greasy. Most of them like the scent though they seem to have a difficult time describing it. People who have tried the Herban Cowboy Shave Cream liked it so much that they have tried other Herban Cowboy grooming products. 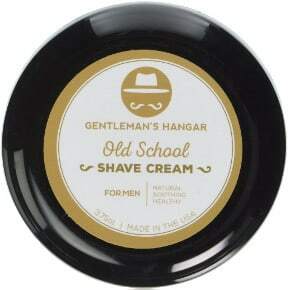 The Gentleman’s Hangar Genuine Old School Natural Shaving Cream is a shaving product that contains all natural ingredients and is paraben free. It is lightly scented and made in the USA. It contains several ingredients that are healthy for your skin some of which include Aloe juice extract, green tea extracts and Vitamin D.
Users really like this cream and state that, for a natural shave cream, it actually lathers quite well. The light consistency of this product is very pleasing to most users and leaves their skin smooth. It has a light sandalwood scent which is quite pleasant. It will also moisturize your skin and give you a refreshed feeling. While this shaving cream is a little expensive, the price is well worth it since it lasts a long time and the high quality of the shave your get makes it worth the price. The Avalon Organics Moisturizing Shave Cream comes in a 3 pack of 8 ounce tubes making 24 ounces in all. This moisturizing shaving cream is enriched with beta glucan and has some excellent ingredients such as Aloe and plant oils that nourish your skin while you shave. Users like the fact that it is paraben free. It lubricates very well and provides for a smooth and close shave. It has a clean scent and one tube is extremely long lasting. It helps reduce razor burn and does not irritate the skin. The cream itself is smooth and non-foamy and is somewhat transparent that allows users to see exactly where they are shaving. People also find that the Avalon shave cream has a nice masculine scent, but works so well that even women like using it on their legs. It also leaves the skin feeling soft. 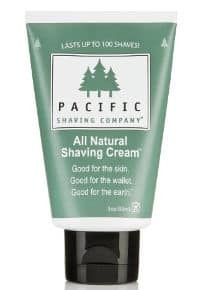 The Pacific Shaving Company All Natural Shaving Cream comes in a 3 ounce tube that is great for both traveling and for home use. This company does not test this product on animals and contains some great ingredients for your skin such as Aloe and Shea butter. It doesn’t really lather so great compared to some chemical based creams but provides a great lubrication for your skin. You can get a smooth close shave that is good for sensitive skin and results in less nicks and cuts. Users find it great for sensitive skin. It is really creamy and has a nice texture. It also has a nice scent which people really like. There are mixed comments about its price. Some users find this shave cream to be pricey and others of an excellent value. Regarding its quality and great natural ingredients, its price is good. All in all, if you are looking for a safer alternative to those chemical laden shaving creams, one of these natural and organic shaving creams may be just what you are looking for.